You are here: Home > Blog > Flora & Fauna > Holly – a fodder crop! We are familiar with holly (Ilex aquifoloium) as part of Christmas decorations, as a hedging plant, and its many varieties (variegated golden and white forms) as ornamental shrubs, but its use as animal fodder is perhaps less well known. 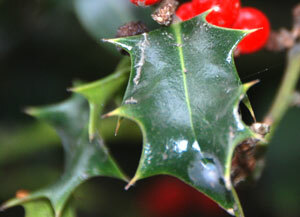 Holly leaves and young branches were used, notably in northern areas (particularly around the Pennines) as winter feed for sheep and sometimes cattle.In other areas there is some evidence that it was used to feed deer. 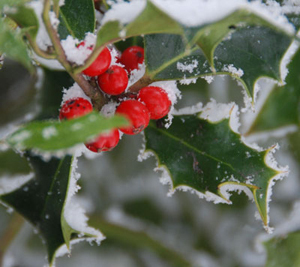 Holly was used as a supplement or replacement for hay when food was in short supply or the land covered with snow so the animals could not graze. Holly was also valued as it offered shelter to animals. It seems that it was the practice to lop some of the upper branches from the trees (for the sheep or cattle) and this ‘pollarding’ did not harm the tree. Thus, holly being essentially evergreen was able to provide suitable fodder throughout the winter months.It was probably for this reason that holly groves were common in various parts of the country.Holly groves or clusters of holly were known as ‘hollins’.What was meant by a ‘hag of hollins’ is perhaps less clear.A hag can refer to an enclosure, a boundary hedge or a portion of woodland (often one ready for felling). But what of the holly prickles?Surely they would deter all but the most determined and hungry of animals?The leaves that form at ground level are indeed very wavy, with large triangular ‘teeth’ bearing spines but as the tree grows (and holly can reach up to 80 feet) the leaves become less spiny.To quote W Bean (a former Curator of the Royal Botanic Gardens at Kew), “The tops of good sized trees will be found almost wholly furnished with quite entire leaves”.He goes on to suggest, “The spines are a means of protection against grazing animals, and are no longer needed when the trees become tall.”Hence, the practice of cutting branches from the holly some distance up the stem, where the leaves bore few, if any, prickles. See the British Agricultural History Society web site http://www.bahs.org.uk/ and search the back numbers of the Agricultural History Review – see the articles Holly as a Fodder in England by Martin Spray, 1981; Holly as a Winter Feed by Jeffrey Radley, 1961.
i’m feeding holly to sheep and goats. they turn from the summer hay to brouse the berries first, then the leaves, then strip the bark. i’ll be planting more. I found one mention of it in google on a farmer’s discussion board – the options seemed to be either a sprig of holly every year, or a spray with some random chemical from Pfizer every three days! On a visit to farms in France my husband came across the practice of putting a holly branch up in a cattle yard to prevent or cure ringworm, has anybody else heard of this? Here in Stocksbridge just north of Sheffield derivatives of ‘Hagg’ and ‘Hollin’ are a locally common name indicating past land use as described in this article. There are small areas of almost exclusive holly woodland remaining, often with stunted oak woodland in the same area. Makes for a unique and lovely landscape!